Must be a Licensed Electrical Engineer; Preferably with previous training on water supply and pressure management; Preferably knows how to drive and holds a driver’s license. Graduate of any Engineering course or any recognized vocational education program in electrical or industrial electrical training with 2 years of relevant experience; Computer proficient; With valid Driver’s License. 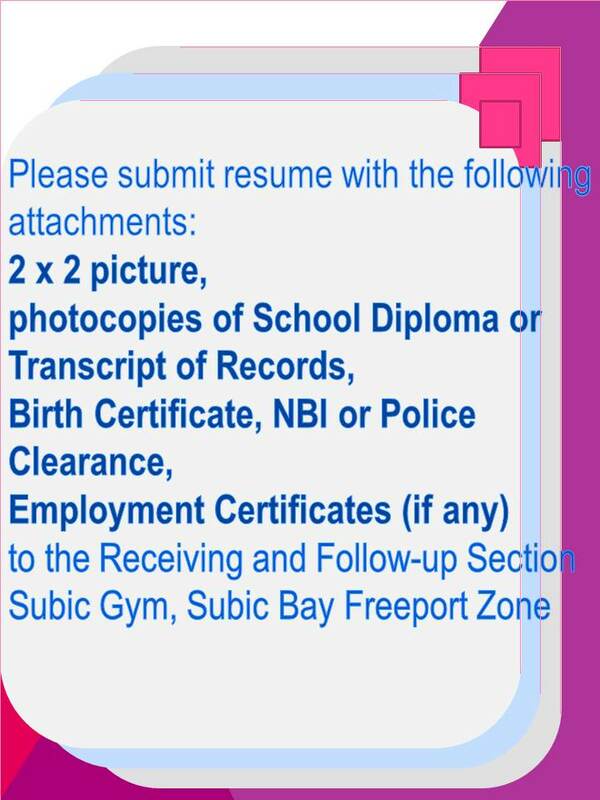 At least 2 years in College / Senior High graduate; Computer literate; Can operate Windows program; Keyboarding skills of 50 words or more per minute; Can render overtime and cancelled offs; Full time career. Male; At least High school graduate; Certificate of Training from TESDA is an advantage; Must be able to work all shifts and in all environments; With or without experience. Graduate of BS Information Technology or any computer course; Fresh graduates are welcome to apply. Male; Graduate of BS Accountancy; Fresh graduates are welcome to apply; With good moral character and trustworthy. Male; Knowledgeable with Banquet Service (Skirting and basic service); Willing to render overtime; With pleasing personality, flexible; With good moral character and trustworthy. Male; At least College level; At least 5’7” – 6’0” in height; Has a valid Driver’s License; With good communication skills is an advantage; With pleasing personality, flexible; With good moral character and trustworthy; With related experience is an advantage. Male; Has a valid Driver’s License; Willing to render overtime; Familiar in Manila route; Knowledgeable in basic troubleshooting on engine. Female; BS Engineering graduate; Must have good communication skills; Can be able to comprehend which issues to prioritize and which details to monitor; With or without experience; Fresh graduates are welcome to apply. Female; Single At least 5” in height; Graduate of any 4 year course. Male; Single At least 5’4” in height; Graduate of any 4 year course. Female; A Bachelor’s Degree in Accountancy; At least 2 years experience in accounting, finance, taxation, audit, payroll, financial record keeping or bookkeeping and reporting; knowledge in general accounting and taxation; Knowledge in Accounting systems and other applications with strong Microsoft Office and Excel skills; Ability to work independently with minimum supervision; Ability to think critically and keen on details; Has the ability to communicate effectively in English language, both oral and written. Male; At least High school graduate; At least 2 years’ experience in fabric cutting; Knowledgeable in various pattern making and fabric cutting operation; Physically fit. Male / Female; Bachelor’s Degree, Preferably Sales and Marketing or Operations Management; With experience in Sales and Inventory; Can work with minimal supervision; Analytical, detail oriented and fast learner; Knowledgeable in MS Office (Excel, Word, PowerPoint, Outlook and Access) and other software; Flexible, Patient, Trustworthy; Possession of valid Professional Driver’s License. Male / Female; Graduate of BS Nursing; Must be Registered Nurse; Pro-active, Flexible and Adaptive; Can perform with minimum supervision; Fresh graduates are encourage to apply. Male; Graduate of Electrical / Mechanical Engineering; Graduate of a 2 years related Vocational Course (Refrigeration and Air Conditioning); Working experience in Refrigeration and Air Condition, troubleshooting is an advantage. Female; With pleasing personality; With least 6 months experience in any restaurant. Male; With pleasing personality; With least 6 months experience in any restaurant.